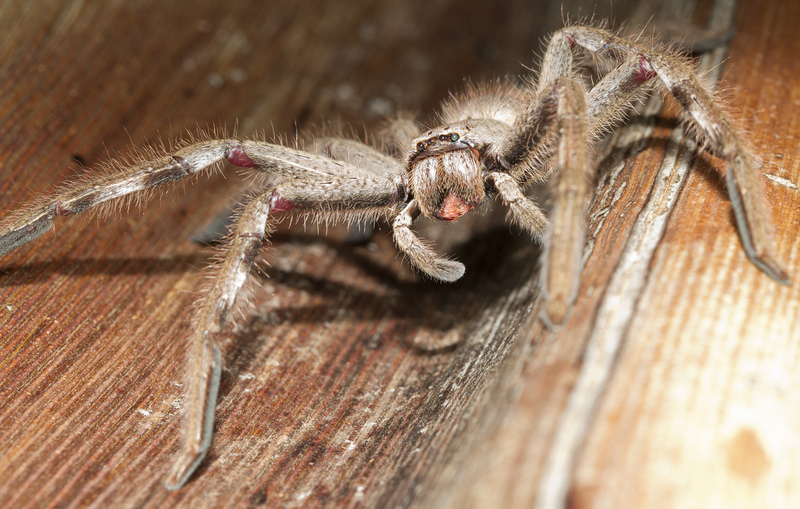 What is a Huntsman Spider? Belonging in the Sparassidae family, the huntsman spider is differentiated from other spider families because of its long legs and large size. Typically, the color of a huntsman spider is a subdued shade of brown or grey. Its legs are enveloped with protruding spines giving them a hairy appearance, yet their body is very smooth. The average body size of a male huntsman spider is around 0.75 inches (19 mm), whereas females are slightly larger at 0.90 iches (23 mm), though different species of huntsman will vary in size. As is quite common, females are bigger in the abdominal area, but males have longer legs than females. The huntsman spider populates various locations in the world, covering side swathes of countries and continents, in semi-tropical and tropical climates. They are dispersed in so many areas because they have been carried away on ships unintentionally and managed to survive in their new homes. So long as the climate is not too cold and they are able to withstand winter, they will survive long enough to procreate and increase in numbers. Huntsman can be more specifically found in Japan, China, and India, through southern Africa to Southeast Asia and even in countries of the Mediterranean. They can also be found in the United States in states like Florida and Hawaii. Depending on the location, huntsman are referred to in different names. For instance, in Hawaii they are called cane spiders, but in Africa they are known as rain spiders due to their habit of running for shelter prior to rainfall. Another name for the huntsman is the wood spider, named after its ideal habitat. Huntsman make their homes in wood piles, tree bark, sheds, mineshafts, and garages. Due to their flat bodies, they are excellent at surviving in narrow spaces found in houses, vehicles, and rocks. Nests are not necessary for the huntsman spider because, as their name suggests, these creatures hunt and salvage food on the ground. Due to their carnivorous nature, these spiders prey on insects and invertebrates. Depending on their size, huntsman spiders will even prey on skinks and gecko lizards. Tired of pesky cockroaches in your property? Huntsman spiders love to feed on them, so homeowners are recommended to simply remove them outside to the garden instead of killing them and they will take care of another problem for you. Two birds with one stone. The average life span of a huntsman spider is around 2 years. After they mate, females can lay up to 200 eggs in one egg sac, which it will shelter beneath rock or in bark. The perfect watchman, she will tirelessly guard her eggs, foregoing food for the livelihood of her unhatched babies, waiting until they hatch.